This is SimpleTiger's style guide, meant to direct our world towards simplicity and action. We want to keep this guide simple and short, but also rich with the information that matters. Skim it, learn it, live it. The chief things to keep in mind, at heart, and in action. Leave your ego at the door. We know you're good, but if it doesn't add, it subtracts. Be humble and call out your mistakes. We all mess up, don't try to hide it, embrace it, move forward. Communicate everything. Don't be vague, be concise, to the point, be accurate, and don't leave things to chance. Keep it simple. Clean aesthetics, concise and clear communication, don't over-complicate the plot. Be effective. Take the 80/20 approach to everything, define what works, know your strengths, exploit them, and win. Be a self-starter. We want autonomy naturally as people, we want you to embrace that, think for yourself, but be sure to re-iterate the first five points when doing so. Focus on quality. Above all else we want the quality of our work to speak for itself, make sure it does that and your work will never be questioned. Always find a way to replicate yourself. You are only one person, however extraordinary you are. Find a way to make the things you do apply to something larger than yourself, a process, a focus, a value, replicate your successes for the entire ship to move forward. Put emphasis on the "why." There needs to be a reason behind everything we do, a logical function for every movement and action. When consulting clients or talking to each other we need to give as much context and reasoning behind actions as possible, context is the key between information and understanding. In writing, referencing, and promoting. When writing, don't be afraid to use a first person perspective. When referring to the SimpleTiger team, say "we" (if you're an employee, obviously). When referencing SimpleTiger, capitalize S and T.
Use these logo assets for everything. What we live, breathe, eat, and drink. Other than caffeine. We blog to educate, to entertain, and to learn. Focused on quality, actionable information, and rich stories. Each blog post needs to be written with a story in mind, thinking from the perspective of Disney's famous quote, "I would rather entertain and hope that people learned something than educate people and hope they were entertained." 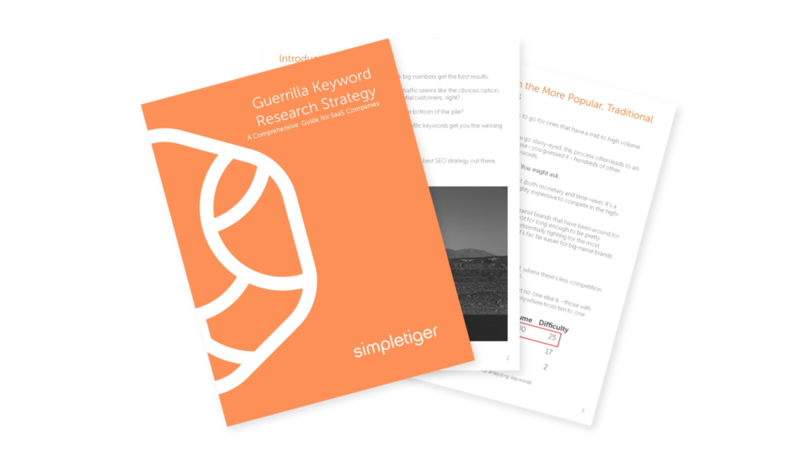 Whether for client, or SimpleTiger, our blog posts need to be focused on an end-goal. What is the point of this article? Is it to answer a question, to drive traffic for a specific keyword? To solve a problem? To provide information? These should all be considered. Write from the first person, use proper grammar, use Oxford commas, don't uppercase needlessly.